The multi-scale Monte Carlo lab aims to connect macroscopic simulations of patient dose distributions with simulation at the sub-cellular scale, connecting physics to biology. The research efforts use Monte Carlo simulations to study ionizing beams and their effects on human tissues. The overall goal is, to develop a comprehensive model that predicts macroscopic outcome from microscopic Monte Carlo simulations. To achieve this goal, we use a two-pronged approach. Macroscopic scale: We use Monte Carlo simulations to better understand uncertainties in patient treatment deliveries, and investigate how treatments can be improved using additional information available in the Monte Carlo method, such as the linear energy deposit (LET) and the relative biological effectiveness (RBE). The TOPAS project (TOol for PArticle Simulations, TOPAS website, Documentation) developed a Monte Carlo system in collaboration with UCSF and the SLAC National Accelerator Laboratory that is widely used in (proton) radiation therapy. Microscopic scale: We use nanometer-scale simulations of the initial radiation insult to biological structures, such as the DNA, mitochondria or other sub-cellular components to investigate the dependence of biological outcome on the radiation type, the presence of (gold) nanoparticles, and other biological properties of the irradiated tissue. Our goal is to provide an extension to the TOPAS platform, called TOPAS-nBio, to model radiobiological experiments. By approaching biology from two sides, we aim to close the gap between the macroscopic and microscopic scales. At the nanometer scale, we work on including chemical reactions, biological structures and mechanistic modeling of repair kinetics. At the macroscopic scale, we try to capture the underlying biology by modeling outcome based on additional information, such as the LET and the microscopic equivalent, the lineal energy transfer, y. Lab Head: Jan Schuemann, Ph.D. 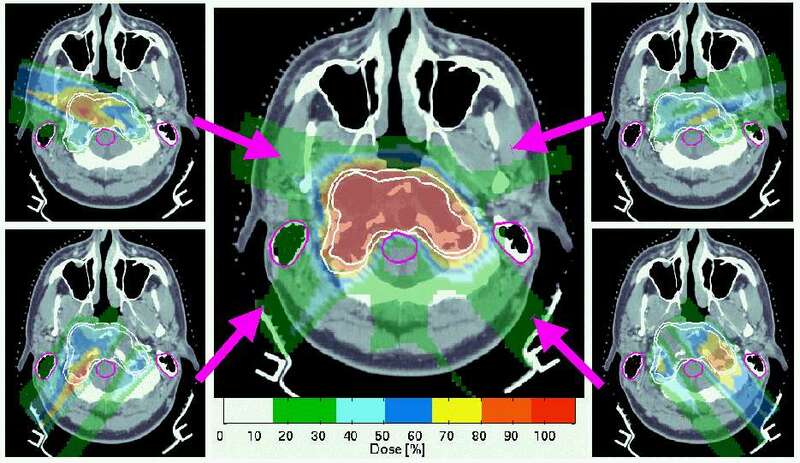 The majority of patients treated with radiation therapy also receive other treatments, ranging from surgery and chemotherapy to recent additions like targeted agents and immunotherapeutic approaches. In the Radiation-Drug Treatment Design Lab we develop and apply methodologies to describe the interaction of these systemic therapies with radiation in the context of specific clinical indications, with the aim to design rational clinical trials and patient-specific treatments. The simulation research efforts use Monte Carlo simulations to study photon as well as proton beams. Simulations are used for commissioning of beam delivery systems, for quality assurance of clinical beam delivery, as well as for dose calculations to assist in treatment planning.